This example is not a continuation of other examples and should be treated as if it were done in a new project. In this example, we are going to make a simple game where we have a cube in the scene that is owned by the server and all the clients can see it being moved by the server. Now that we know that we need to sync the position and rotation of a cube, we can design our network contract for that object. We will first open the Network Contract Wizard which is a UI provided by the Bearded Man Studios team to make it easy to design your network contracts in an easy way. To open this menu, go into Unity and select "Window->Forge Networking->Network Contract Wizard". 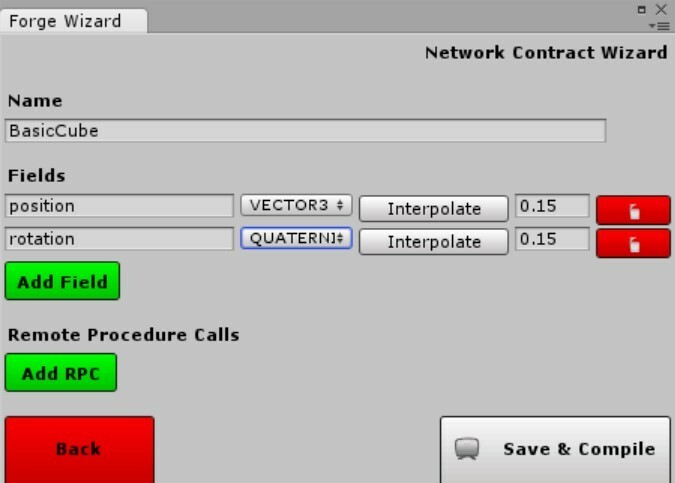 Once you have opened this editor you will be presented with a list of all the Network Objects currently available, to learn more about this please see the document on the Network Contract Wizard as we will just be going over how to create a network object through the contract wizard. To start, click on the "Create" button near the top and you will be presented with the create UI. In here, we have 3 major fields of interest, the Name fields, the Fields field, and the Remote Procedure Calls field. The Name field is where we create the name for our Network Object and behavior, this is a friendly name that should be written in "Pascal case" to follow the C# convention since it is going to be a part of the class names that are generated. The Remote Procedure Calls field is where you will design any Remote Procedure Call (RPC) function signatures. We are not going to go over this field in this tutorial as we do not need it for the goal we are attempting to accomplish. When we use the Network Contract Wizard (NCW) we are actually generating a lot of network code based on what has been input into the editor fields, this actually cuts out a lot of work that you would have to do by hand. There is one class in particular that we want to extend from, this class name will be BasicCubeBehavior. The naming convention for this generated class is _____Behavior where "_____" is the name we typed into the NCW. 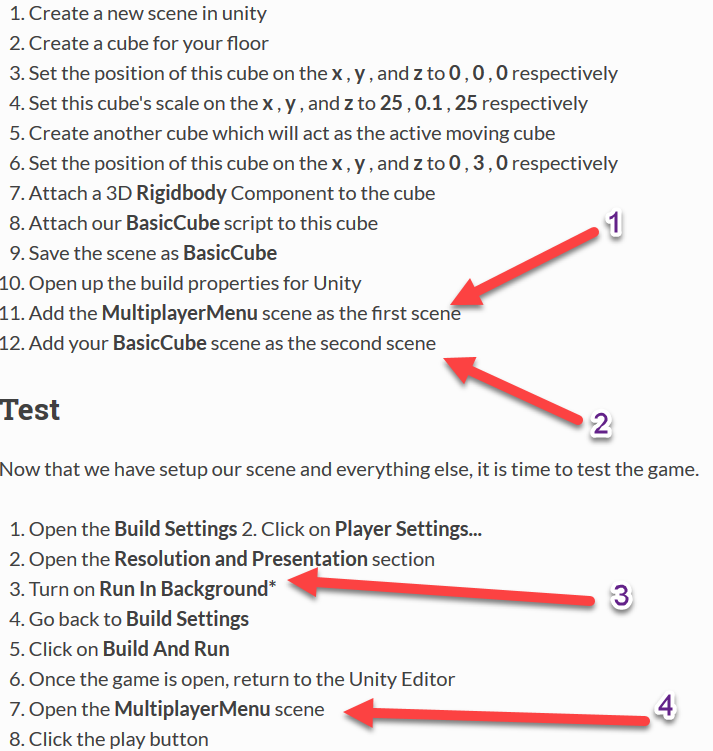 Let's now create a C# file in Unity and write our basic game logic, we will name this file BasicCube. As you can see from the code snippet above, you can determine if the current player is the owner of the object using the networkObject.IsOwner boolean comparison. This will allow you to make code specifically based on the owner of the object. In this case, since the cube is going to be in the scene at start, it's owner is the server. In the snippet above the client (non owner) will update the transform position and rotation of the cube (the object this script is going to be attached to) to the position and rotation received from the server. Since we turned on interpolation, all of the smoothing is done "behind the scenes". Now the server in this case will just assign the position and rotation variables of the networkObject. These are the two fields we created in the NCW by the way. All generated network objects from the NCW will have a networkObject member variable that you can access from the deriving child. Whenever you assign a field of this object it is replicated across the network if the assigning user is the owner of the object. Now that we have done all the network programming required for our end goal, it is time to setup our scene. Now that we have setup our scene and everything else, it is time to test the game. Now if you move around the cube in the editor, you will see the movements replicated to the clients.